Diamond Wire Sawing is capable of cutting many sizes and shapes of opening. Capabilities of wire sawing from pump bases, free standing columns or entire structures. Wire sawing can handle the largest of projects. Diamond Wire Sawing uses a multi-strand, continous-loop wire with diamond beads to cut through any concrete structure while producing no vibration and little noise. The Diamond Wire Saw is up to seventy-five percent faster than conventional concrete removal methods. It will make cuts exactly where they’re wanted. There is no vibration, so micro cracks won’t form in the surrounding concrete. 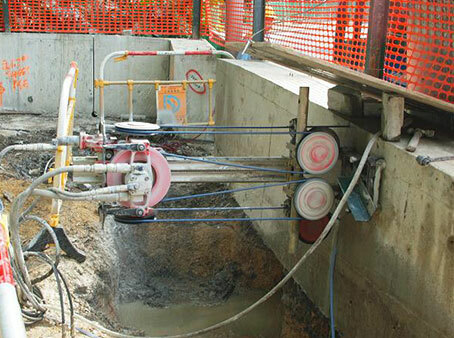 The Diamond Wire Saw produces the least noise of any concrete cutting or removal method.